It is possible to arrange our Yoga safari to different destinations upon request: We can go through the mountains & canyons, passing by green oasis and soft sand dunes – or we can head down to the sea and combine our desert trip with some snorkeling. Important is, that our journey will lead us to remote places – away from mass tourism – so we can concentrate on the quietness of Sinai’s nature and our Yoga sessions. The safari can be arranged as a Camel – or as a Jeep Safari. And will always be joined by Bedouin guides from South Sinai and a professional Yoga teacher. Aim is to enjoy the breathtaking landscape of the Sinai desert; to explore the amazing natural canyons, the panorama view from and on the mountains and the soft sand dunes. We will have time to relax and be one with the nature. Our Yoga teacher for Ashtanga und Hatha-Yoga will offer Yoga session twice per day (morning & evening). It is important for us to choose the right place for that, because only locations with a good atmosphere and optimal conditions can have a great effect. Usually – especially if you are walking a lot – we will do an Asana session in the morning, and a Pranayama session in the evening. Between the yoga classes you will have all the time you need, to enjoy the nature and discover Sinai’s amazing beauty and secrets. 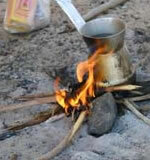 Our Bedouin guide will lead you to unforgettable places, where we prepare our camp sites for the night. We cook our meals on the open fire; prepare Bedouin tea and the original Bedouin bread - before we enjoy our night under millions of stars.